Miley Cyrus and Patrick Schwarzenegger avoid each other like the plague at Katy Perry's birthday party. 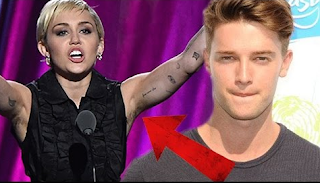 Sorry hopeless romantics, but Miley Cyrus and Patrick Schwarzenegger may not be the friendliest exes in Hollywood. The "We Can't Stop" singer stepped out Friday night to attend a star-studded birthday for one of Katy Perry's closest friends. But while hanging out at Blind Dragon, the former Disney star found herself at the same party as her ex-boyfriend. E! News can confirm the twosome did attend the same event and ultimately managed to keep their distance between each other. "They didn't talk," a source revealed to E! News. "They never interacted." Instead, Patrick kept busy in the main lounge area with close friends while Miley headed to the karaoke room where she sang songs with Katy. Selena Gomez was also in attendance for the special celebration. E! News confirmed the Hollywood couple had called it quits for good in April. The six-month relationship hit a serious rough patch after Patrick was caught getting a little handsy with his ex-girlfriend while they were on spring break. While Miley and the University of Southern California student were spotted on several dates thereafter, it wasn't enough to stay together.